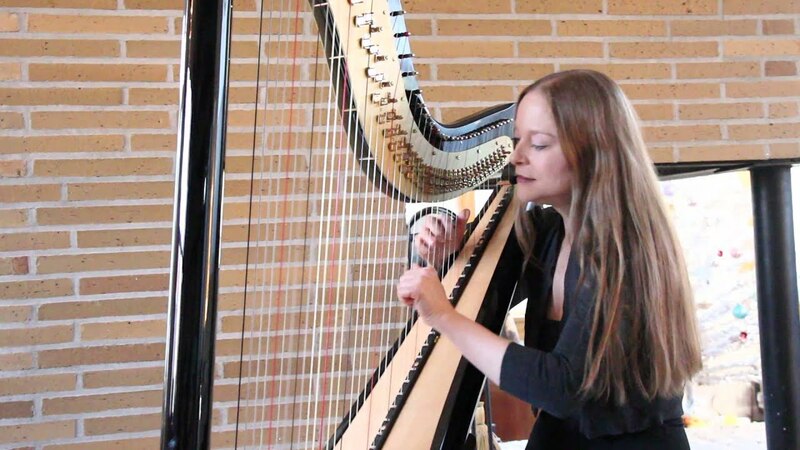 David Bowie "Space Oddity (Major Tom)"
from the album "Christmas Harp"
Erin can play solo harp or she can sing & play. She does all styles of music (classical, of course), with specialties of celtic, jazz, opera & pop (50's, 60's, 70's, 80's on up to Adele, Radiohead, John Legend...). Her album "Harp Town" is on iTunes. I use GigSalad regularly, and Erin was the most spectacular performer I have had. Her voice is simply amazing, and she can sing everything from classical, to opera, to jazz, to modern to carols! The harp is so versatile and really beautiful. This is a superb performer, and a lovely person to have at your events! Erin played at our wedding yesterday from the ceremony to cocktail hour, and played and sang all through the reception. We loved her harp renditions and vocals to many popular songs, both intimate and upbeat. Guests told us in person and have been texting since then that they thought the harp and trio was a great classy touch, better then the traditional band or DJ- and we agree! We were able to mingle with guests all night without the music being overbearing. Erin was also able to play a traditional Italian dance song (Tarantella) on request, and killed it!!!!! Thanks so much Erin! Erin was on time, professional and a joy to have. We booked Erin, along with her cellist, with less than 2 weeks until our wedding and they were still able to grace us with their beautiful music and Erin's absolutely stunning voice. Even with some last minute changes on our part, they had no problem adjusting to what was needed to make this day the best it could be. She was the glue that pulled our ceremony and cocktail hour together. Erin and her cellist made for an unforgettable experience that will last a lifetime. The only thing I regret I have is not booking them for the entire reception. I'd give her 10 stars! Erin Hill was just wonderful. She played the harp beautifully and has the voice of an angel. I would hire her again in a heartbeat! Erin performed for our ceremony and cocktail hour. Our guests were still talking about her the morning after our wedding. She plays so beautifully and her singing just adds to the entire experience. She brought our guests to tears with the slow songs and then had them singing along to the more upbeat tunes. Highly recommend her! Erin went out of her way to expertly perform two special requests. Her performance was mesmerizing and I have heard nothing but raves about how she contributed to our event. Brava! We had a last minute cancellation the day of our corporate event. Turned out to be a blessing in disguise because we then found Erin. She was able to accommodate our event that started in a matter of hours and was super easy to work with. I was intrigued by the electric harp and she did not disappoint. Her song selection was great and her performance was amazing. We had a lot of comments about how great she was and unique. Highly recommend! Erin was phenomenal! She made my grandma's 95th birthday so special and she did it with very short notice! She was easy to work with and very talented. Erin was great to work with. She was available to talk to when needed to go over details. She arrived and had everything set up before we made it to the venue! We also really appreciated that she brought everything that was needed for the harp, e.g., music stand, sound amplification, etc. to the event - we did not have to add anything to our long To Do list. Erin was friendly and professional. Everyone enjoyed the music selection. We would highly recommend her and would book her again if needed. Erin was professional throughout our event. She exceeded all expectations when she learned, played, and sang a surprise song for our son at his communion! I would definitely use Erin again! Erin was nothing but a joy to have at our show. She brought the event to life. I would work with her again in an instant. We wanted someone unique and Erin was just that. She provided an amazing long list of available songs she already knew beforehand, and was even able to learn a new one just for our walk down the aisle as well. She, her instrument, and her music were all so beautiful it really created such a wonderful atmosphere within our wedding. Erin was absolutely amazing to work with! She was receptive to what I needed, and flexible when my event plans changed a little. She even stayed later when our event went a little longer! I didn't have to worry about her being late, she was already at the venue and sorted out where she was meant to be set up--I didn't have to worry about a thing! The music went off without a hitch, and we got so many compliments for hiring her. You will not go wrong with hiring Erin. You'll be in good hands! Erin was recommended to us by another harpist who was already booked for our date. Erin provided us with an expansive list of songs of all different genres and worked with us to pick out our favorites. She was very flexible in making our playlist. We loved her solo harp performance during the ceremony, and loved her harp music accompanied by her singing even more! At the end of the night she even performed one final song privately for my new husband and me, which for us was the highlight of the whole evening. We cannot recommend her enough! Talented and reliable - most amazing harpist you will find! Erin's profile really impressed me. I contacted Erin first without knowing whether the venue where we wanted to get married allowed music or not. Erin got back to me very promptly with a quote, which was outside of my budget. I later checked on the venue’s website and understood that the venue did not allow music. I took my time feeling sad about our wedding. I finally emailed Erin my concerns about the pricing and venue rules but did not expect a reply. Just a few minutes later, Erin phoned me and advised that she called the venue and confirmed that the no music rule no longer applies and that she could offer me an alternative option to help fit my budget. In addition, she sent me a sample track of the song I wanted for our wedding and learnt a new song for us. This was planned all under a week! On our wedding day at Central Park, the wind was blowing at 20mph, and it was pouring cats and dogs - I am not kidding! Everything that could go wrong at a wedding, went wrong - a truck in front of us broke down, we could not get hold of the groom and my veil was almost being forgotten by the makeup artist to set on my hair. The wedding time was postponed again and again because of the heavy rain. My fiancé (husband now) arrived at the wedding venue and found Erin had been waiting patiently for 2 hours sitting in the freezing cold. The wind blew the rain onto everybody’s faces, my dress, and her harp. When I walked into my wedding, the music was being played exactly the way I wanted. Despite all the things that went wrong, we had our dream wedding thanks to Erin’s help. Erin is talented, easy to work with, and reliable. I cannot say enough good things about her. She really made our day special. We would definitely recommend her to everybody we know. Erin is a pleasure to work with and not only is she a truly talented artist, but she is a supreme human being. i recommend her skills and dedication to her passion for your event or requests. Erin Hill is a top-notch professional and talented performer. I look forward to hiring Erin for our next corporate event. It was almost ten years ago that Erin played for my Wedding. She played harp, solo. She has such a large repertoire of material, and she is tireless, and has such a positive attitude. Her services are also reasonable, and you will be very satisfied with her customer service. I have seen her a few times professionally and her voice is clear and sweet. She is a talented performer, and a top notch musician. I recently had the opportunity to work with Erin and she was wonderful and more than I could have wished for in every possible way. It was a very last minute engagement, as I made a very last minute decision to hire an opera singer two days before the event (an intimate dinner party at a restaurant for my Dad's 75th birthday). Erin was so prompt, responsive and wonderful within an hour of my submitting a request for proposals on Gig Salad. I had no idea what to expect since I had never used the service and simply stumbled upon it when doing a Google search. Erin showed up exactly as she promised, or I should say she seemed to float in like an angel with a harp, and then proceeded to play for two hours. Needless to say my father, as well as everyone in the restaurant that just happened to be there having dinner, was simply mesmerized by Erin's talent. She is not only an incredible singer and musician, but her kind and gentle spirit was an extra treat that made the evening simply unforgettable. I am hoping to throw another event just so I can be blessed to hear Erin again. She is magical. Being someone who has been deeply passionate about music all my life and now working in the music industry, music was bound to be a highlight of my wedding. 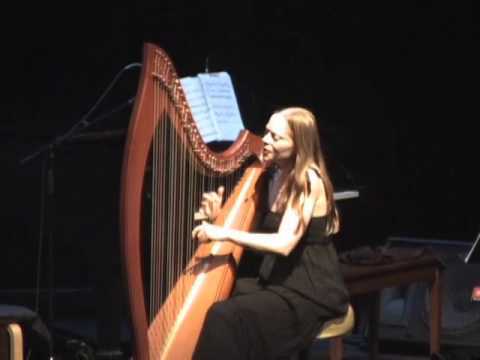 I had heard Erin and her magnificent harp a few years earlier at a music festival and was simply blown away. Her voice whimsical, beautiful; her harp conveying the sense that magic was in the air. And as if playing beautifully were not in itself enough, her repertoire was diverse enough to accommodate both our musical quirks in a way that perfectly encapsulated the relationship between my wife & I, never moreso than in her rendition of Simon & Garfunkel's "59th Street Bridge Song" in the recessional (relevant because we had just days earlier moved away from NYC and because, as a child, I used to dream of reuniting Simon & Garfunkel for my wedding). She was an absolute hit with our guests. Erin was professional in every respect, communicating effectively and not demanding too much of our time on the day of the event when our time was hard to come by. I could not recommend Erin highly enough. After watching Erin perform at Joe’s Pub in NYC we knew we wanted her to play at our wedding. We received so many compliments on her performance during our ceremony and cocktail hour. She was a perfect touch to the evening. Throughout the planning process Erin was very professional. Planning a wedding can be very stressful and Erin made her part very easy and stress-free for us. She provided great song suggestions that would entertain our guests. We would not hesitate to book her again for another event. Absolutely wonderful! I could not have asked for more. Erin is a true talent with a passion for her music. Everyone raved and her presence made our event. We have booked her already for our daughter's wedding in 2015. Erin Hill, the perfect musician for a truly memorable event! Erin Hill is a magician on the harp and has a fantastic voice to go with the music, from Buddy Holly to Danny Boy to Broadway. We were absolutely thrilled with her singing, her song selection, her command of the harp and the magical sounds she created. And above all she is a wonderful lady to provide an enchanting evening. We hired Erin to play at our wedding this past weekend and it was one of the best decisions we made. She is incredible on the harp as well as has an amazing voice. Our guests couldn't stop raving about her. While we did not get to hear all of her numbers, the two pieces that were most important to us - Pachelbel's Canon as the wedding processional and a Beach Boys song as the recessional - were played beautiful and sounded powerful and strong. What's more impressive, prior to the wedding we requested a few surprise crowd-pleaser songs which Erin had to learn from scratch, and she obliged happily. When she played those numbers our guests went nuts! Erin is highly responsive over email, has a great sense of humor, and is an absolute pleasure to deal with. We would recommend her to anybody. Erin is an amazingly talented harpist with the voice of an angel! She is so professional, kind, sweet and well worth having at your wedding or event!! We had her play during our outdoor wedding ceremony on 9-7-14 and she was beyond amazing! She is so beautiful and professional! She was hired to play just the harp during my wedding but also sang a few songs with her angelic voice as guests arrived which was an added surprise for us! Our guests and my dad especially loved her and were shocked and amazed by her talent! Very punctual, timely and flexible with requests and knowledgable with all song types and requests! Love love love Erin! She is the best! Many thanks again!! Erin was perfect for what we wanted - she's not your traditional harpist, in fact you can look her up on YouTube and prepare to be amazed! Erin played at our ceremony and she was wonderful. She was easy to work with prior to the ceremony and so very accommodating. She played contemporary music for us, even some pop music and it sounded great. We highly recommend Erin! It's rare to find a world class harpist who also has a world class voice. Erin Hill provided the music at my son's recent wedding service and cocktail hour, demonstrating her amazing instrumental and vocal chops. Her version of Etta James' "At Last" during the service caused one of the groomsmen to turn to my son and remark "I thought you might have oversold the harp player. You definitely DID NOT oversell the harp player!" Not only was the music world class, but Erin was a delight to work with in every respect. Pleasant, personable and professional. I highly recommend this multi-talented artist for any occasion. Erin is one of the warmest, talented people you'll ever meet. Her repertoire is extensive, and her music inspirational. She performed at our TEDxNYIT event. Her music was one of our "ideas worth spreading" sessions. Our audience described her performance as...."unique", "authentic", "inspirational", and "you won't see this any where else". Bravo. Insurance: $1,000,000 - Liability Insurance with Emery & Webb, Inc.
Erin Hill is a New York City harpist & singer with a #1 album on the Billboard world chart. She plays for all types of events in the NYC area, Long Island, New Jersey and beyond: weddings, corporate functions, cocktail hours, concerts, house concerts, parties, etc. She has played & sung with Enya, Kanye West, moby, Cyndi Lauper, a-ha, Levon Helm, Randy Newman, Sinead O’Connor, Jewel, and has played solo at The Royal Albert Hall. She is also known as The Pretty White Girl from Comedy Central’s Chappelle’s Show. Erin’s album "Harp Town," released by the Los Angeles label Cleopatra Records, is available on iTunes, Amazon, Spotify, etc. It features 18 tracks of Erin’s harp & voice arrangements of songs by The Beatles, Smashing Pumpkins, Lady Gaga, Kate Bush, Alicia Keys, Roxy Music, Adele, Tim Buckley, Til Tuesday, Kansas, Leonard Cohen, Rihanna, Radiohead, U2, and even Edith Piaf and Frank Sinatra. Erin is also a Celtic harpist and singer; her Celtic album Four Leaf Clover hit #1 on the Billboard World chart in 2009. Erin has played harp at Carnegie Hall, Lincoln Center, and she also played harp for the US Open Tennis Championships. She was featured in an HBO “Game of Thrones” promo, playing the “Game of Thrones” theme on her harp, and she’s been featured on Bravo’s “Million Dollar Listing.” She is the voice & harp of Tafne for the upcoming Android video game “The Legacy of Barubash.” USA Today and Elysa Gardner premiered Erin’s music video “Lookout, Science” as an exclusive, and she won an Independent Music Award for her album “Girl Inventor.” Erin did Original Music and Sound Design for the Drama Desk Award-nominated “That Play: a Solo Macbeth.” Erin is also known at the Ritz-Carlton on Central Park South in NYC for her rock ‘n’ roll arrangements on solo harp, as well as harp & voice. For events, Erin can play either solo harp or she can sing and play, whichever is needed. She also plays often as a duo, trio, or group with other instruments (upright bass & drums, flute, cello, violin, etc.). She plays (and sings) all styles of music (including classical, of course), with specialties of Celtic, jazz, opera, and pop (50’s, 60’s, 70’s, 80’s on up to Lady Gaga). Her concert harp is electro-acoustic, and can be played with a small amp for intimate events, or plugged into a sound system for large venues. Erin toured with the Lincoln Center South Pacific as harpist and pianist, and is the harpist on the new soundtrack for The Fantasticks, on Martha Wainwright’s self-titled debut album, on various commercials (Dunkin’ Donuts, etc.) and on MTV2’s Wonder Showzen. She’s a singer, songwriter and musician on the Dream Jam Band’s major label debut on EMI. As a voice-over artist she’s been heard on commercials from Coca-Cola, Comcast, and Match.com to Play-Doh, Walmart and Dunkin’ Donuts. In the film Clear Blue Tuesday, she is a composer, screenwriter, and actor. The New York Times said: “Erin Hill, as a giddy, harp-playing Trekker, is a standout… The best and funniest scene in the film is Ms. Hill’s, a first date that looks promising until the conversation turns to the relative merits of Star Trek: Voyager…..” Erin was also in the Tim Robbins film Cradle Will Rock (and appears on the soundtrack alongside Eddie Vedder & PJ Harvey); HBO’s The Chris Rock Show; Comedy Central’s Chappelle’s Show; and PBS’s American Masters. As a stage actor, she was in the original Broadway casts of "Titanic," Sam Mendes’ "Cabaret," and "Urinetown" and has twice been part of the Sundance Theater Lab in Utah, originating the role of Ilse in "Spring Awakening" with Duncan Sheik, and as musical director for Lil’s 90th (also at the Long Wharf Theater) with Jo Bonney. She was seen most recently in "A Midsummer Night’s Dream" at Classic Stage Company in NYC alongside Bebe Neuwirth and Christina Ricci (Newsday called her “the dangerously enjoyable Erin Hill”). Erin toured with and opened for a-ha in 2008 in Europe and London, where she played solo at the Royal Albert Hall (see the a-ha.com interview with Erin on a-ha’s official site). Erin is also a huge Beatles fan, and performs regularly with Jimmy Vivino (of Conan O’Brien) and Will Lee (of Letterman) in The Fab Faux. And lastly, she also juggles and is an expert at walking on her hands (one of which can be seen in the film Clear Blue Tuesday, and the other on The Rosie O’Donnell Show, the 52nd Annual Tony Awards, and Late Night with David Letterman). It Had to Be You - from "Casablanca"